Juggling! Yes, here I am juggling…weaving my wall hanging project, warping, writing and taking pictures for my new book, putting together the translated versions of my first book, planning articles, answering online questions from new backstrap weavers. I have had to come up with some new routines to fit all this in. Most people roll their eyes and sigh in dismay at the word “routine”…dull, boring repetitive. I, on the other hand, am all for it, that is, if it is a routine of my own making and not one that is imposed. Having a fixed routine is the most efficient way in which I can operate. And I do take time out for a little mindless fun! Juggling is both relaxing for the mind and a darn good work-out for the body…at least for an inexpert juggler as indeed I am….with lots of crawling around on the floor picking up dropped balls. 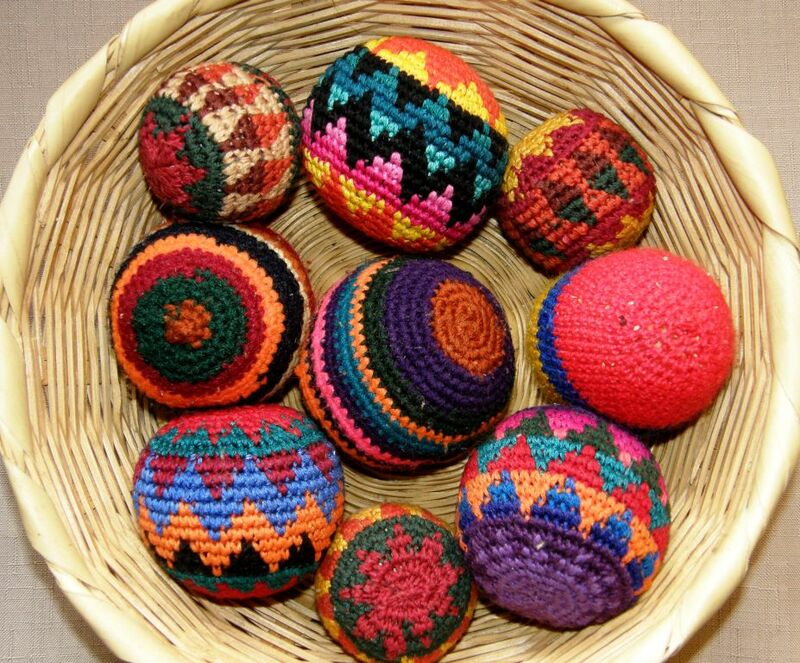 What prompted me to drag out the Guatemalan juggling balls from the depths of one of my woven storage bags?….They are crocheted and I wanted to take a look at how they had been made. 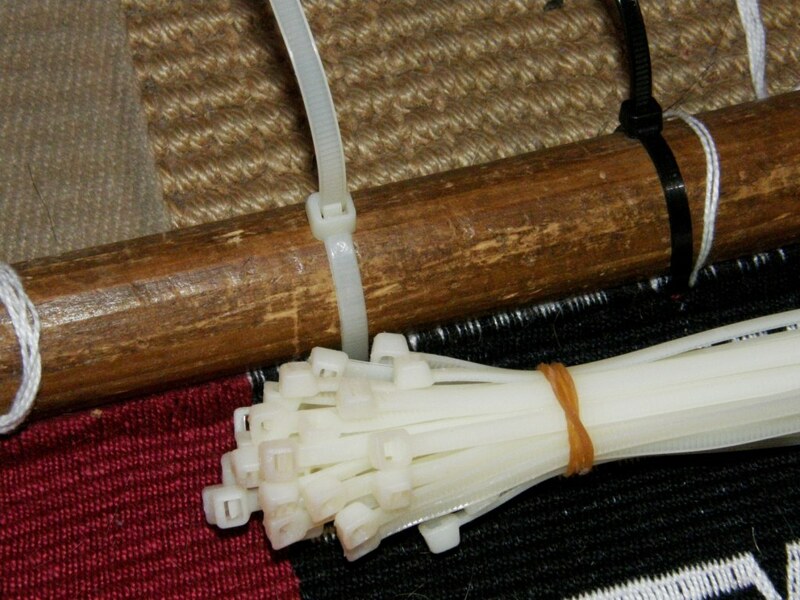 We talk about the simplicity of the backstrap loom and what can be achieved with a loom comprising just a few sticks, or sometimes no sticks at all. What about the wonders that can be created with one small stick with a hook on the end? And what led me to all this?… pictures in Mirja Wark’s book on the woven belts of the Wayuu people of northern Colombia and Venezuela. The designs on these belts are the inspiration for my latest wall hanging project. One picture shows a man wearing a belt with a small patterned bag at his side which Wark says is crocheted. She describes crocheted cotton bags that are used by both men and women. The women carry a medium-size bag called susu. 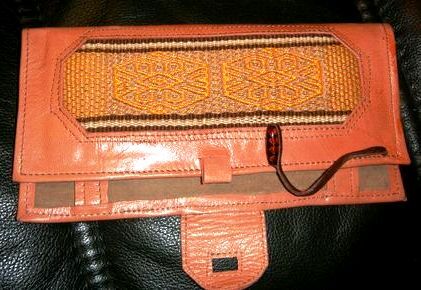 Men have smaller crocheted money pouches called susuchon and other pouches which can hold tobacco, keys and amulets. So it was off to Google and Youtube Land to learn more. I have decided to do without air conditioning and pay for a faster internet service instead so Youtube viewing does not make me want to tear out all my hair anymore! But, finding time to watch all those videos is yet another ball that must be added to the juggling mix. 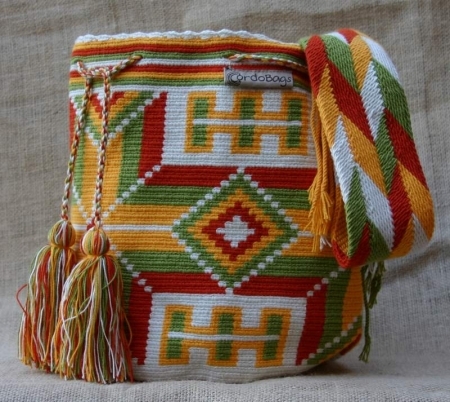 These images of Wayuu susu, which are also sometimes referred to on these sites as mochilas, are from the online store of the Wayuu Taya Foundation. 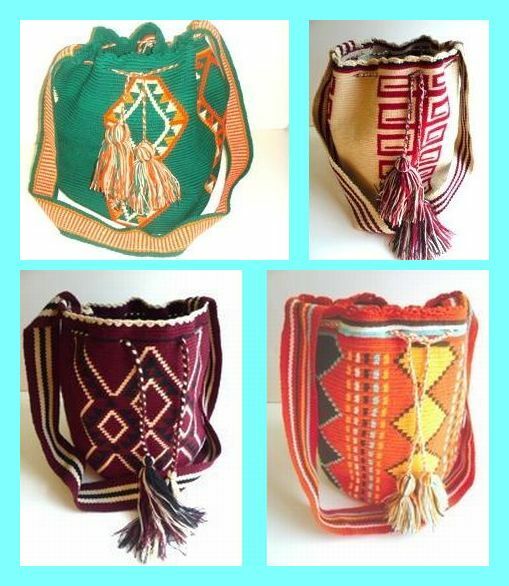 I found that these traditional crocheted bags became very popular outside Colombia a couple of years ago and even prompted an article in the NY Times. 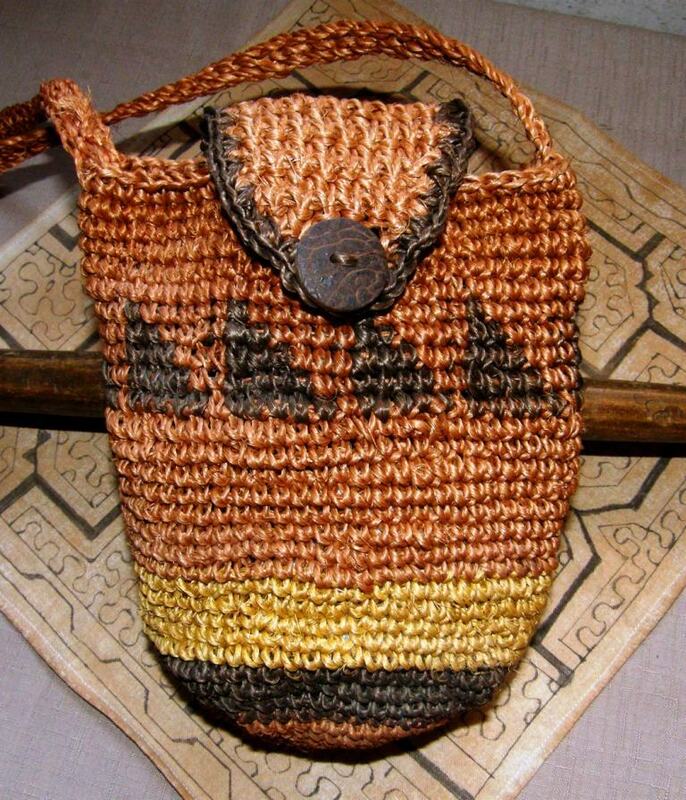 On many sites the bags are described as having been “woven”, “knitted” or “woven in crochet” but we have Mirja Wark who tells us that they are, in fact, crocheted. 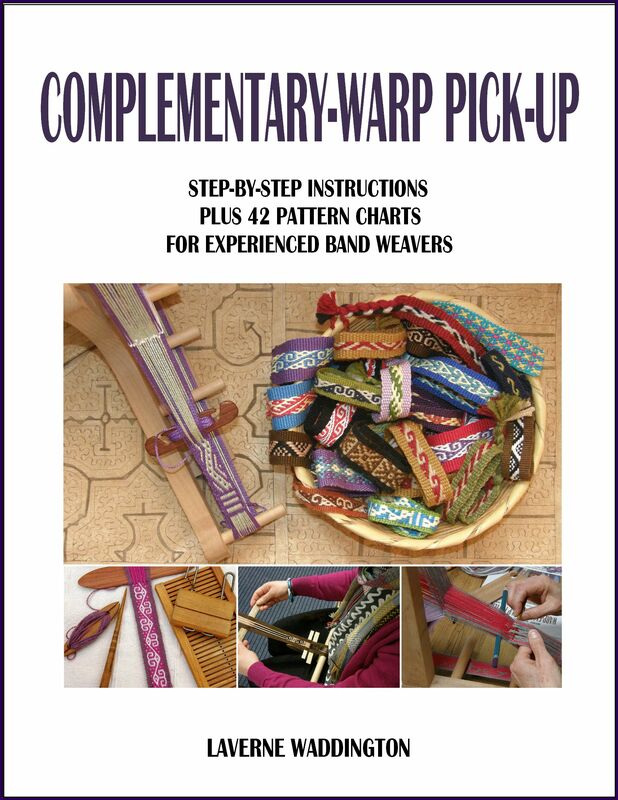 One article describes the straps as having been created on looms. I love the big bold designs! The bag at left is from CordoBags. The following is probably the nicest video I found in my alotted Youtube time showing the Wayuu people and their terribly harsh environment. A woman can be seen carrying her susu, there’s a little weaving showing those loose joined heddles that I talked about last week, some fast and efficient twining in progress (love that part!) and there are two brief segments showing the women crocheting bags. So, here is my latest project which has been inspired by the work of the Wayuu people and the beautiful designs on their woven si’ira which I have been able to see in Mirja Wark’s book. I have made a few adaptations of my own. The triangular “border” design is my own pattern as I wanted something bolder than those shown in the book. The larger design is one of many “block patterns” as Wark calls them and, as I charted this one myself, I cannot be absolutely sure that it is faithful to the traditional design. It falls into a group of patterns called schichirujuna paa which means “like the nose of a cow” in which there are eleven variations. I like how the herringbone design on the edges is similar to the weft-twined design I plan to do along the bottom edge. This is slow work, I can tell you….lots of threads to count and pick up!! I was very unsure about this piece last week and was on the point of putting it aside for a while and working on something else to clear my head. But, I persevered and am now happy with the result. And you may have noticed my new favorite addition to the toolbox at left…cable ties. These are absolutely brilliant for lashing the warp on its piano wire to the loom bar and creating a third selvedge. I was getting really fed up with my lashing cords on this project working their way loose. They always do and I usually just wedge thin dowels between then and the loom bar to tighten them up. This time for some reason, nothing I did was solving the problem. In my recent home de-clutter mission I found a bag full of these cable ties in the junk drawer in the kitchen. They are perfect for lashing but, unfortunately, can only be used for one project as they will have to be cut in order to remove the finished weaving. I wouldn’t use them to lash right from the start as they are wide and space the warps. I would only use them once the weaving has progressed an inch or so to replace the lashing string, which has probably already started to work its way loose. Now back to the crochet. No, I am not about to add this to the juggling act! But, who knows, the next time I am thinking about some on-the-road projects, maybe I will toss a hook in my bag. I know the very basics of crochet. When I went to Ecuador and visited the artisans who work with cabuya fiber, I stayed with a lady who taught me how to crochet this little pouch. She was kind enough to say that it wasn’t too bad for a first attempt. The button is made from the tagua nut and the dye for the cabuya fiber comes from natural sources. I was happy to learn how to do color changes and carry the thread. Whether this color change technique is what is known as tapestry crochet, I do not know. I noticed that there is a group for tapestry crochet on Ravelry and another for fair-isle crochet. I am guessing that indicates that there are differences in techniques. 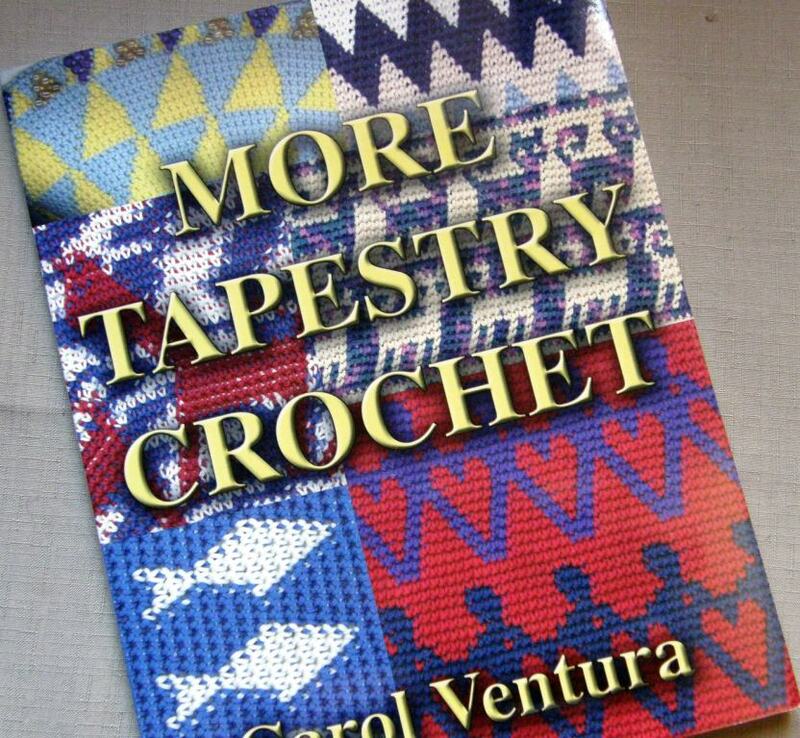 I was given Carol Ventura’s second book on the tapestry crochet technique many years ago and, although I have enjoyed looking through it, I haven’t used it yet. There are some beautiful projects in there for those of us who like imagery and bold geometrics in our handwork. 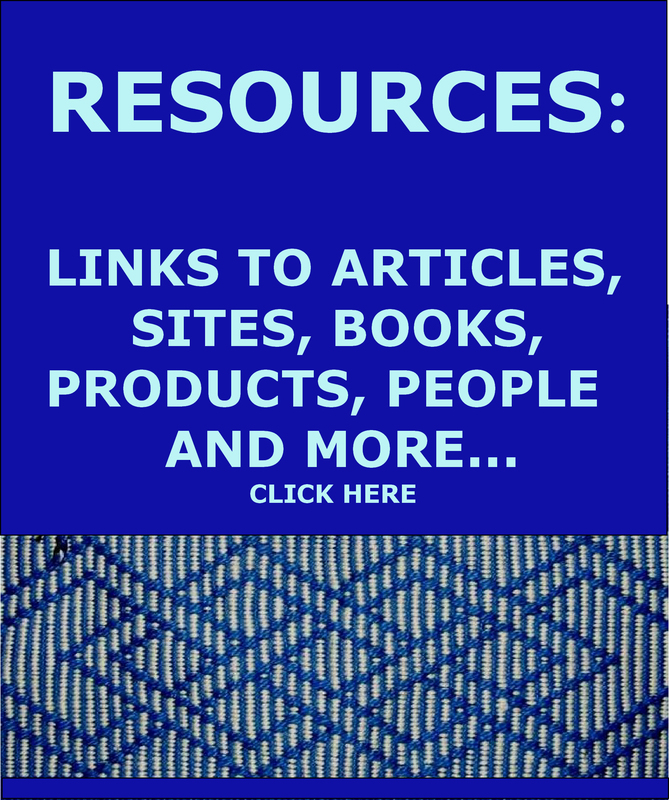 I wrote a post some time ago about the cabuya fiber and how it is processed if you would like to know more. Last year we had a gathering of artisans here in Santa Cruz and Maritza came from Colombia to show us how to crochet with cabuya fiber. 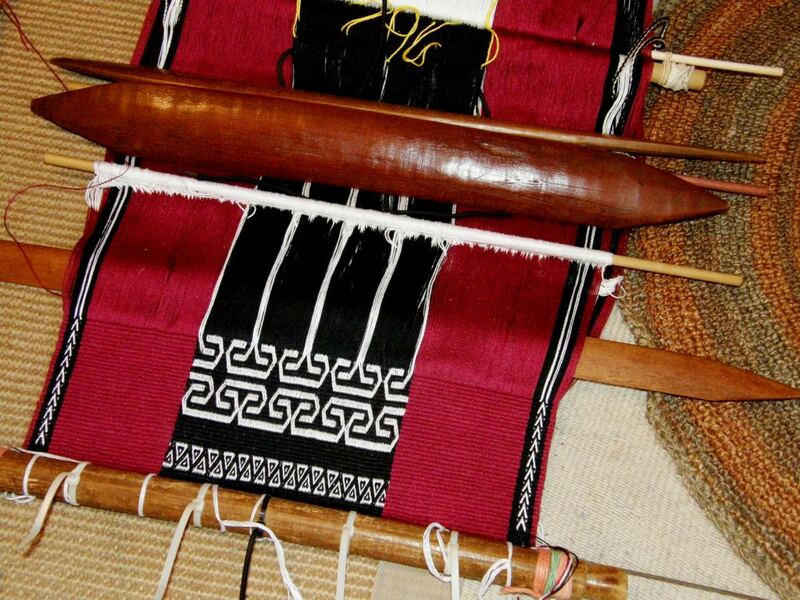 Weavers and craftspeople from Chinchero in the Peruvian highlands, coastal Ecuador, the highlands of northern Chile and lowland Bolivia as well as Santa Cruz locals joined in to learn. I think the thing that has most gotten me all charged up about crochet this week is the beautiful crocheted scarf that Marit from Norway, aka yarnjungle on Ravelry, recently finished and posted. There’s that black and red again! Doesn’t this make you want to grab your hook? 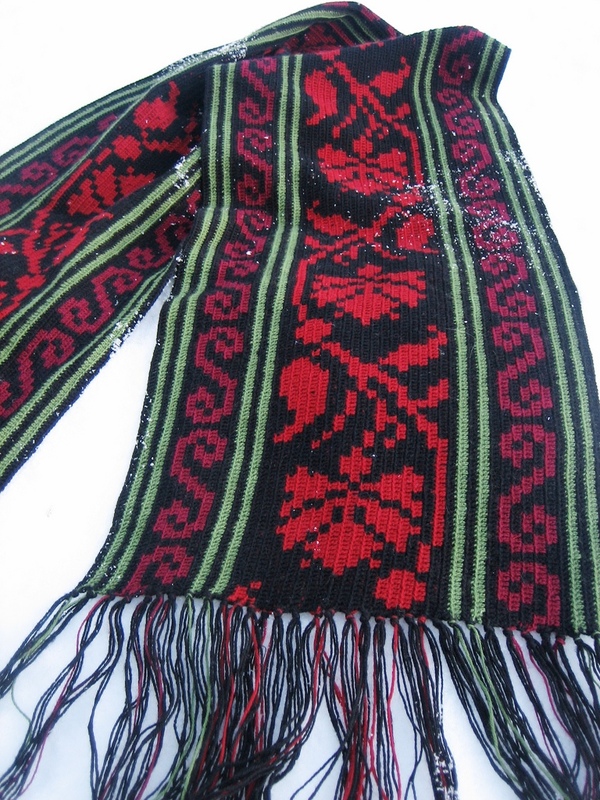 In Marits’s own words…I saw a picture of a crocheted men’s scarf from Sweden in a magazine about nordic folk costumes. 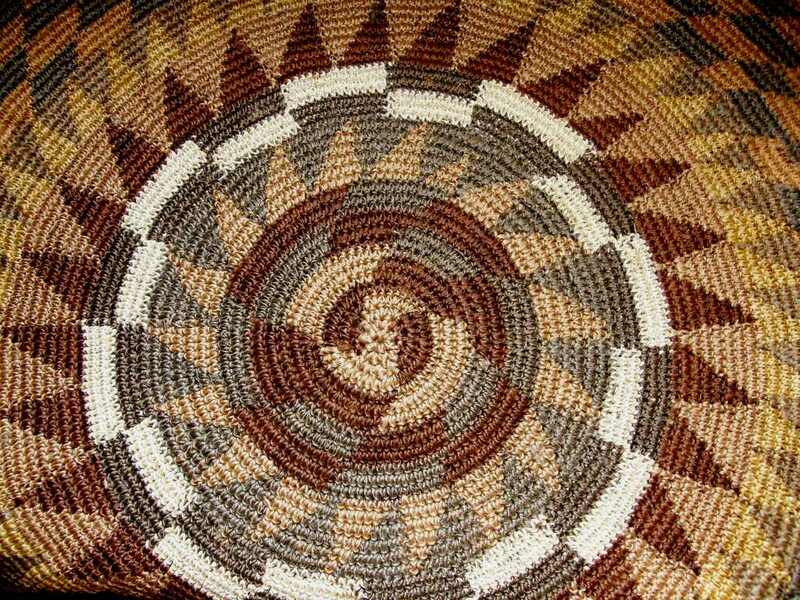 It had a flower pattern in tapestry crochet technique, worked lengthwise, but with double crochet stitches instead of single. Made my own version by throwing together some antique cross stitch patterns. I have come across images online of belts in Mexico woven with flower designs that are quite similar to this. I notice them as, to my eye, they look “un Mexican”, if you know what I mean (funny how we form this idea of what “Mexican” should look like). Again, I wonder, as I was wondering last week, about how patterns may travel and turn up in unexpected places or how they may just develop independently on opposite sides of the globe. 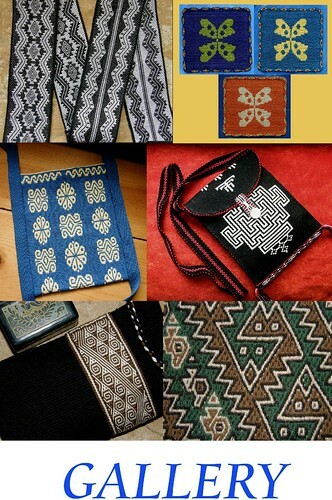 Some of the motifs in Huichol weavings are so similar to traditional Scandinavian finnweave ones. 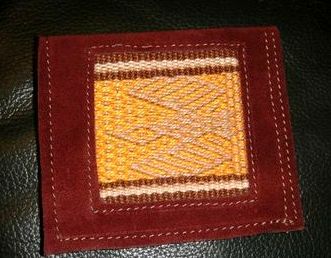 Well, I shall finish this week with some pictures of beautiful work that Sylvie in France has been doing combining her woven bands with leather to make a wallet and purse. 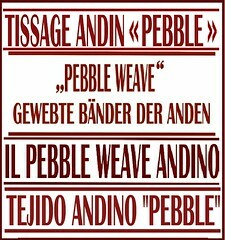 This bird motif in pebble weave is in my book and comes from the island of Taquile on the Peruvian side of Lake Titicaca. What a lovely job Sylvie has done. This motif is also in the book and is one that I invented for a wall hanging. These are great projects and Sylvie definitely has the hang of pebble weave! As this motif is one of the last ones in my book, I expect that Sylvie may be wanting more….hold on, a second book is coming! At lunchtime today, I caught up on last week’s blog post. Good thing I didn’t read it last week or I would have been in suspense all week wondering what your latest pattern was going to look like. STUNNING! When I saw the cover of Ms. Wark’s book, I really loved the patterns and knew you would do something wonderful with that. The crochet bags have such great patterns. I might need to get that book! Thanks Annie. It is hard to know which pattern to choose, they are all so beautiful and the crochet is a whole other story…. Inspiring as always! Is the tapestry crochet similar to Tunisia crochet, using a very long hook? I am not very knowledgeable about crochet techniques, Alaa, but as far as I know, tapestry crochet doesn’t require any special kind of hook. 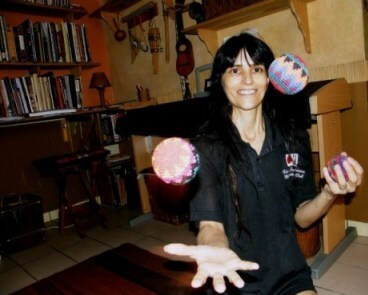 Nice photo of you juggling! I remember my mum making us laugh sometimes juggling oranges in the kitchen. Maybe I’ll try it too…. Thanks for the wonderful post. 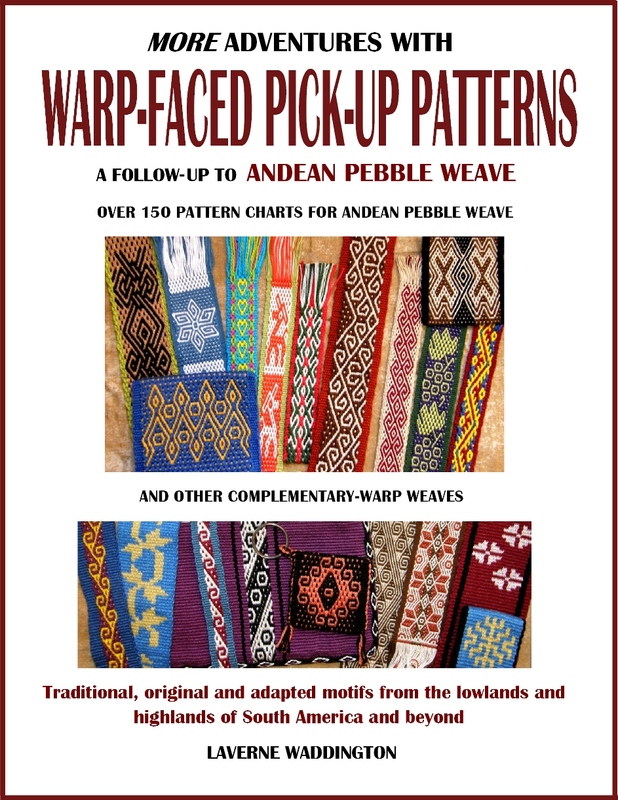 I’m glad the book of Mirja Wark is giving you inspiartion to weave the Wayuu patterns. They live in harsh conditions indeed. Oh yeah, with a bit of care you can actually undo and reuse the zipties, if you don’t cut off the end bit after tightening, by pressing a small pocket knife or screw driver and push down on the plastic where it’s tightened. We use them quite a bit on the bike…I’m assuming you can get them pretty cheap there though in the market….if not, let me know and I can send more if needed. Enjoy crocheting if you’re going to! Hi Anna, I have been getting a few tips about those cable ties. If anyone should know, it would be you after three years on the road using them for the bike, right? I did in fact buy them in Australia but I am sure they won’t be hard to find here. Hope you are finding time to weave!